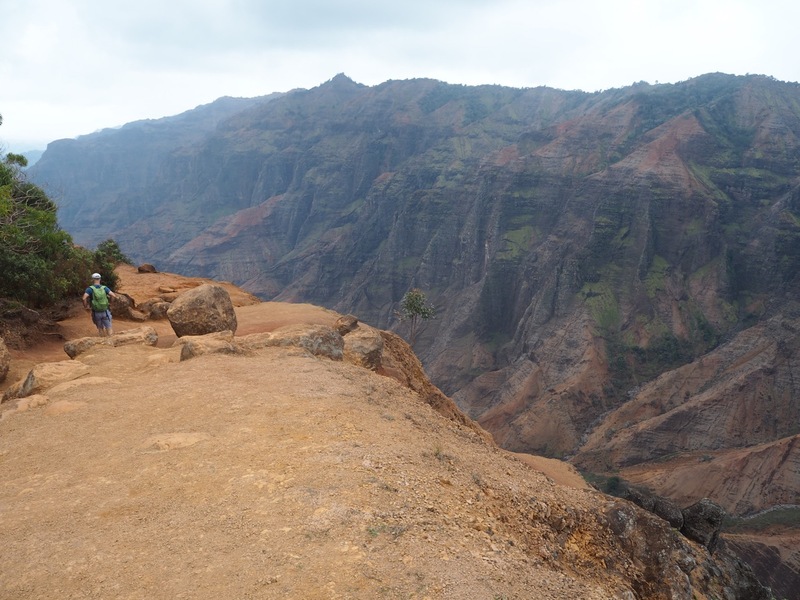 If you love hiking, you will love spending some time on Kauai. 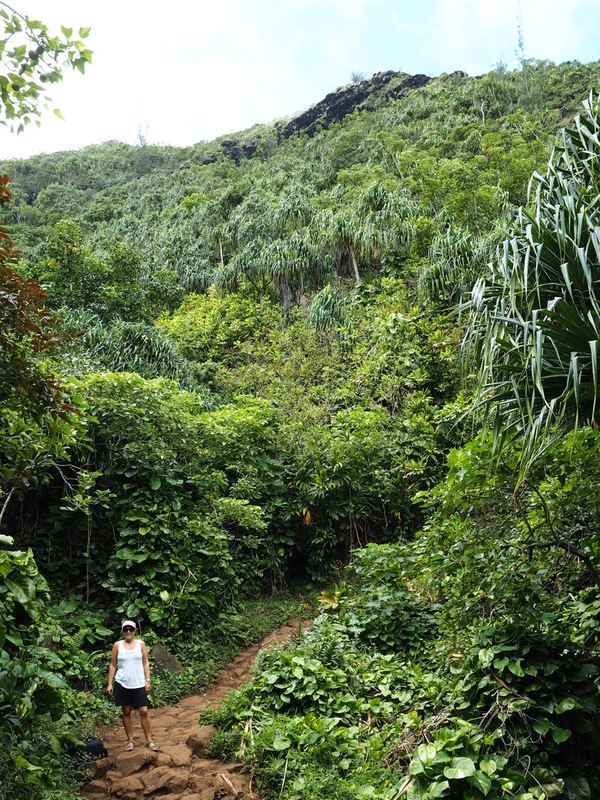 Home to some of the most spectacular trails in Hawaii, Kauai is a hiker’s paradise. You won’t have any trouble finding a hike to match your particular level of fitness or experience. 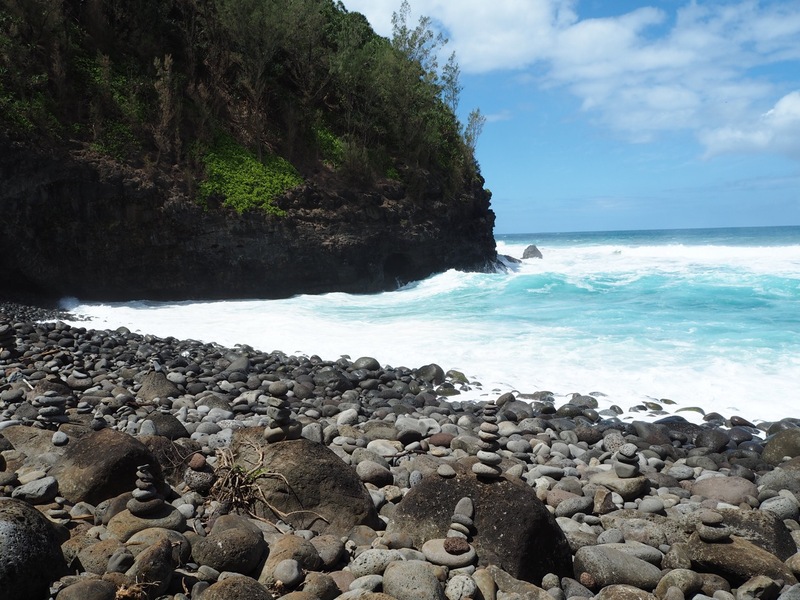 This hike starts at the Ke`e Beach carpark, which also marks the start of the Nā Pali Coast and the start of the multi-day Kalalau trail. 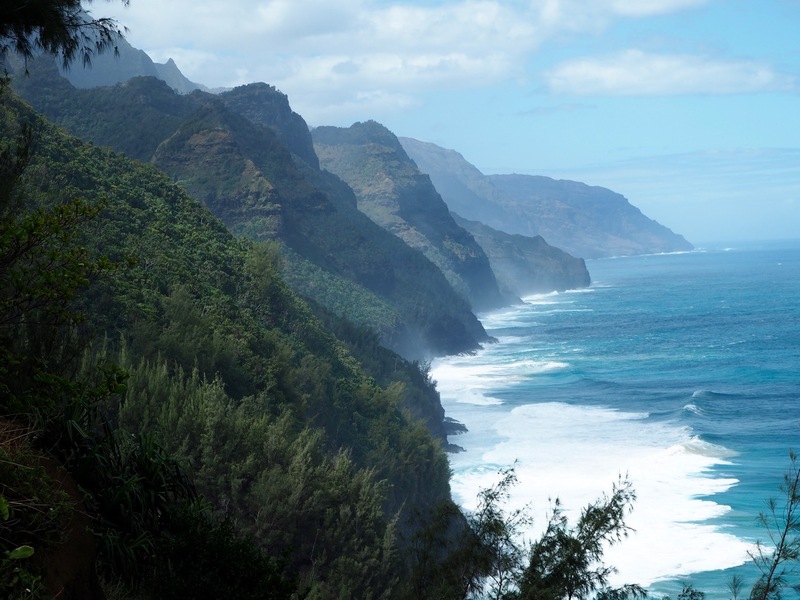 The two mile walk down to Hanakapi`ai Beach crosses rugged terrain and offers sweeping coastal views over the Nā Pali coast and its breathtaking, lush green mountains and soaring cliffs. You are also rewarded with splendid views over the Hanakapi`ai Valley, Ke`e beach and its blue lagoon. Because the trail goes up and down a fair bit, you will need a fairly good endurance level. It can get tough at times but the incredible views will have you stopping for photos a lot, which makes it so much easier! 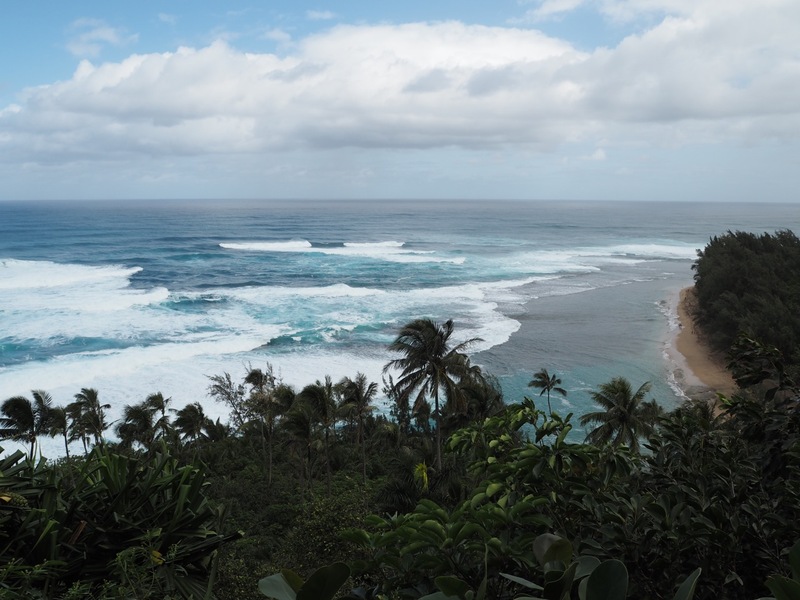 The view over Ke’e Beach. Walking along a muddy path and over slippery rocks. 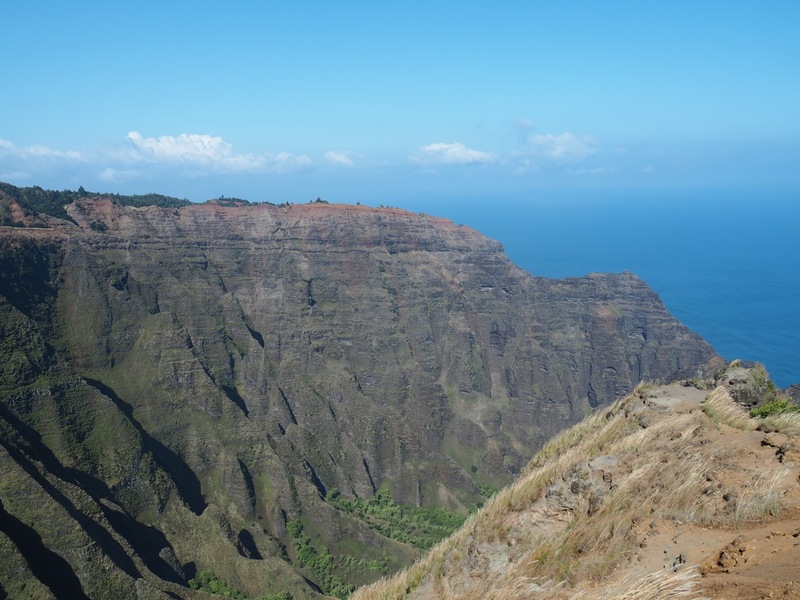 The view of the Nā Pali Coast from one of the lookout points. Before you reach the beach you will need to cross the Hanakapi`ai River which flows down to the sea. Take care here; the current can be strong and flash flooding does occur. Do not attempt this crossing after heavy rain. 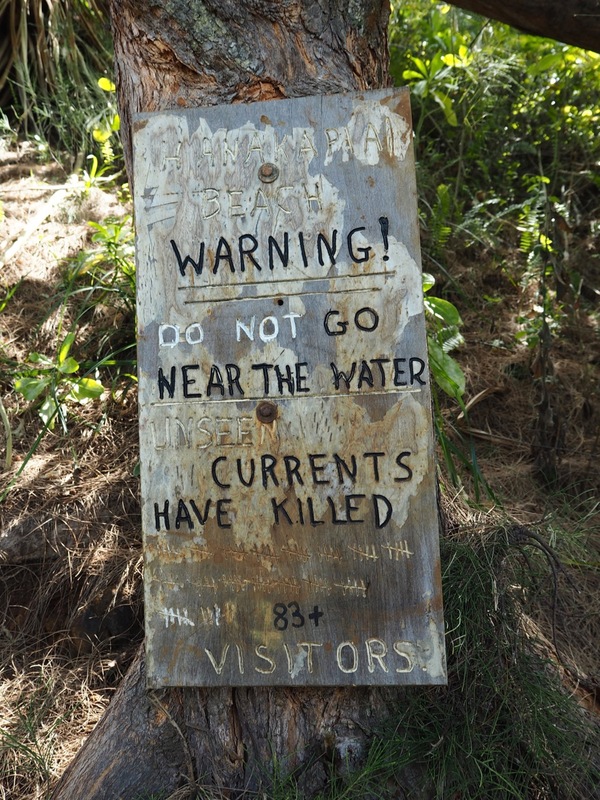 As tempting as it is, do not swim at Hanakapi`ai beach. Yes it’s a gorgeous beach, and yes you might feel hot after the hike down, but Hanakapi`ai is not just beautiful, it’s also deadly! The currents are very strong and many people have been dragged out to sea in a matter of seconds! 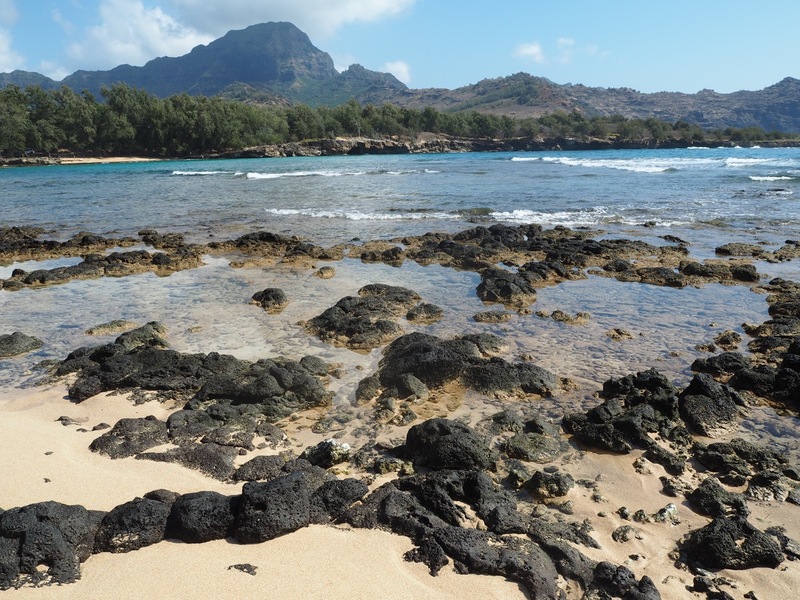 Instead, reward yourself with a swim at the stunning Ke`e Beach at the end of your hike. Bear in mind, this beach can also be rough in the winter months, but at least there is a lifeguard present and if it’s too rough the beach will be closed for swimming. We werent’ joking about the currents! 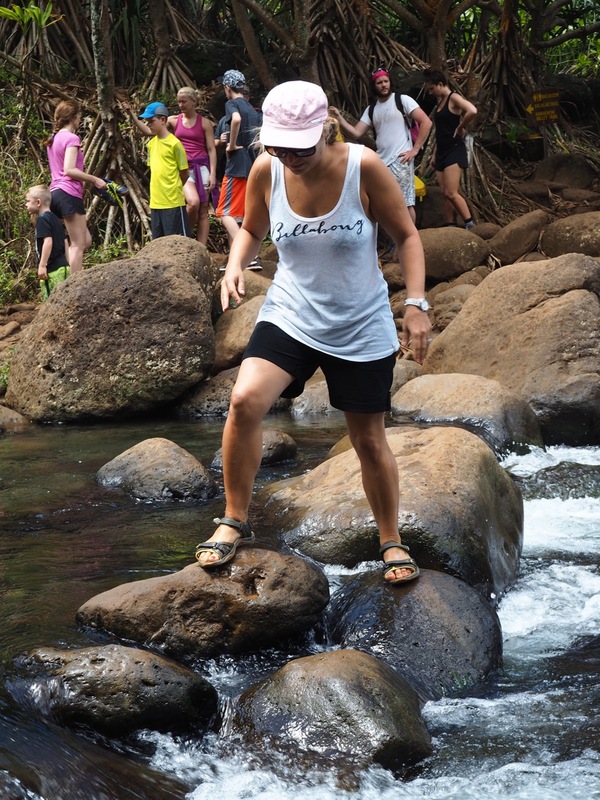 The path is slippery when wet with some rocks to scramble over, so bring good sturdy shoes that you don’t mind getting dirty. Also if you want to cross the river to get to the beach, then some water resistant shoes might come in handy. Bring a lot of water, snacks and a picnic to enjoy once you’ve made it to the beach. Start the hike before 8 am if you want to find parking as it is really scarce. 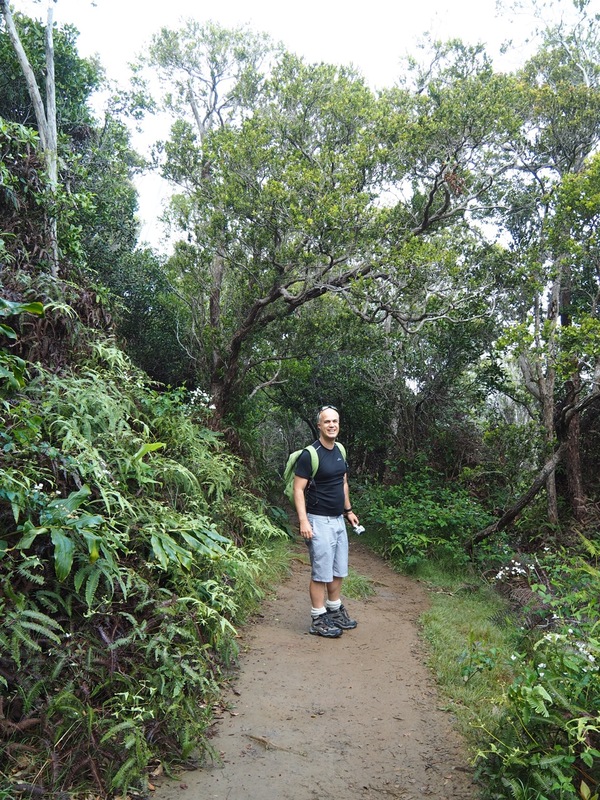 If you are a good hiker and the weather conditions are ok you can hike another two miles up to the stunning Hanakapi`ai falls. Bear in mind that this will make the hike an eight mile trek. Four miles of breathtaking scenery and lush greenery. 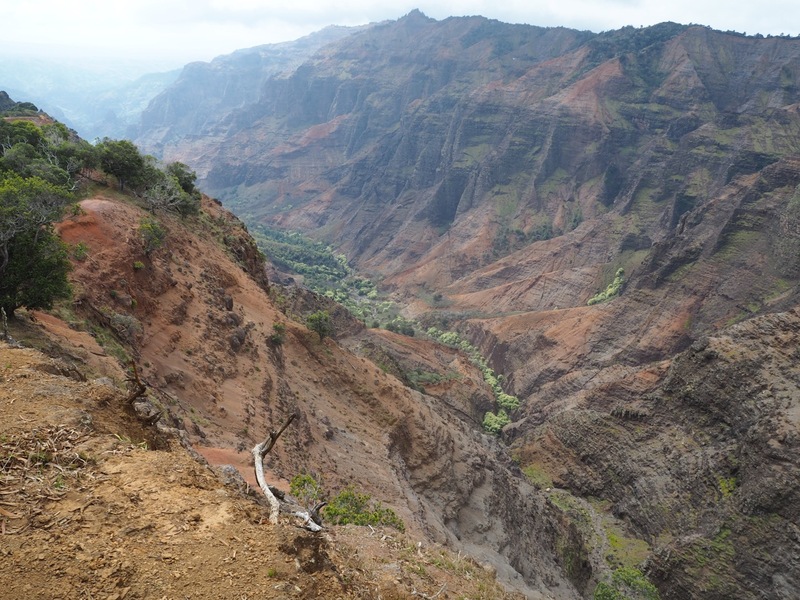 This hike starts at the Pu’u Hinahina Lookout carpark and will take you along the canyon’s rim, offering unique views of Waimea Canyon. The trail ends at the top of the eight hundred foot high Waipo’o Falls. The way down to the falls is not too strenuous, but it can be very slippery after rain, and it does rain a lot in the canyon. The way up is, of course, a lot harder! There is a five-minute detour to the cliff trail at a half mile down; take it on your way up to get some more scenic views. This hike is ideal if you want to take some stunning photos of the canyon. 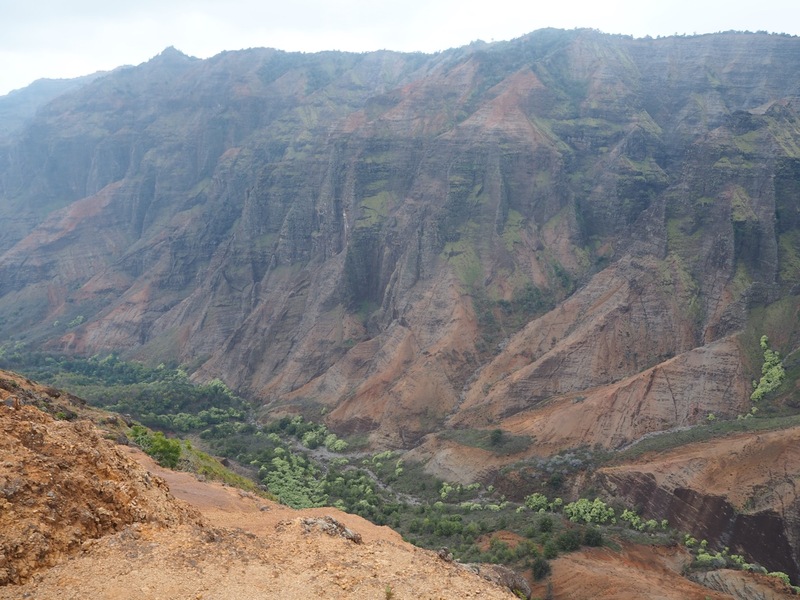 The view over Waimea Canyon from the Canyon Trail. Walking on the rim of the canyon. Wear sturdy shoes as the trail is also very slippery, particularly in wet weather. Bring a rain jacket. The weather in the canyon is very changeable and more likely than not you will be rained upon during this hike. Canyon views from the cliff trail detour. This hike is an easy one and a perfect coastal walk along the scenic South Shore coastline. 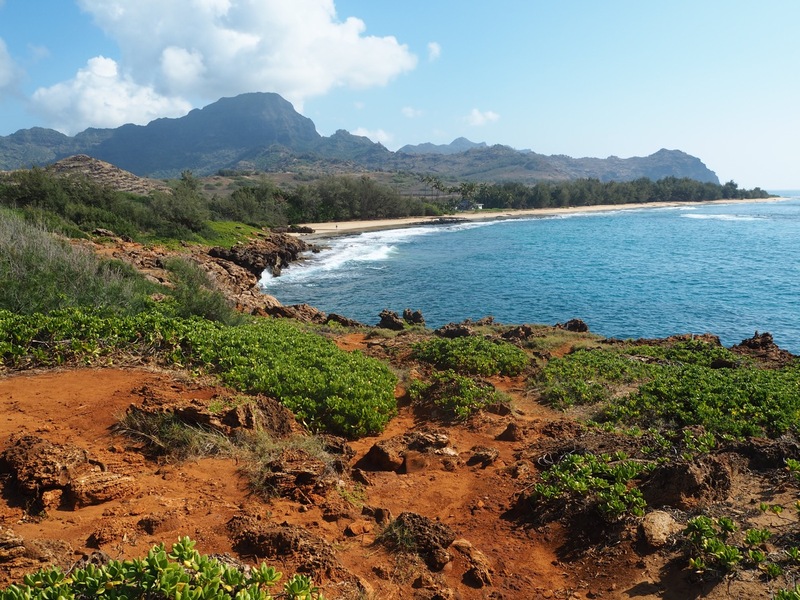 It starts at Shipwreck Beach behind the Grand Hyatt Kauai Resort and finishes at Kawailoa Bay. 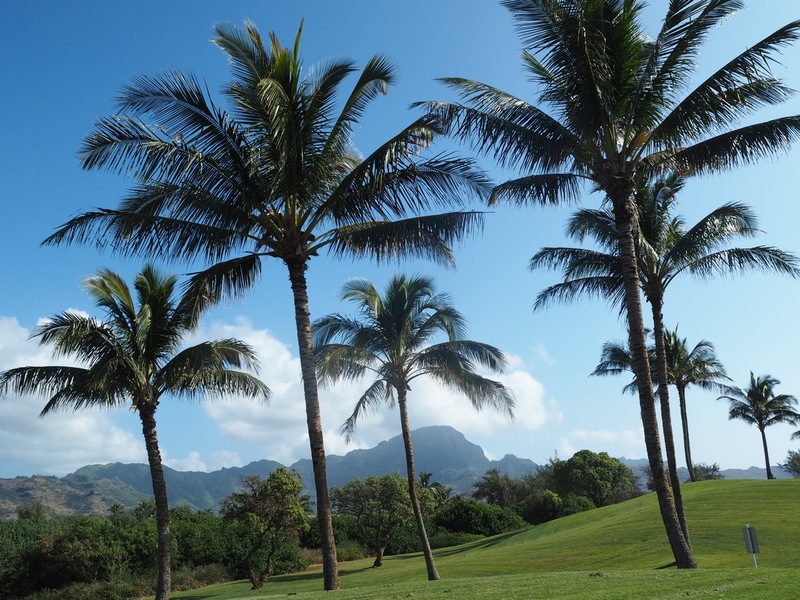 It takes you across sand dune cliffs, and past limestone formations, an old Hawaiian sacred site, a stunning golf course, a cave, some Kiawe trees, and along the deserted Maha’ulepu Beach. 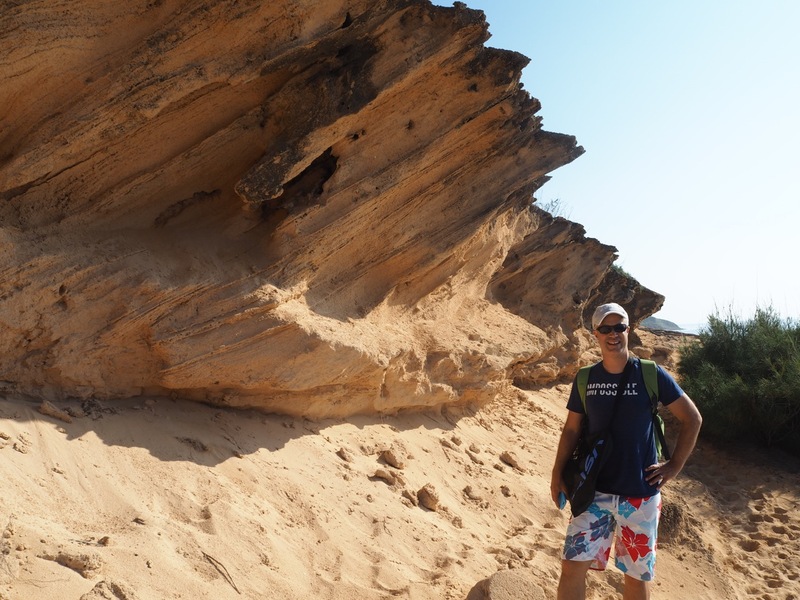 Walking through sand dunes and limestone formations. A spectacular and colourful walk. The golf course on the Maha’ulepu Heritage Trail. This hike is also perfect for spotting wildlife such as seabirds, turtles, and if you are lucky an endangered Monk seal. You may even spot whales breaching on the horizon during whale season; so bring some binoculars! 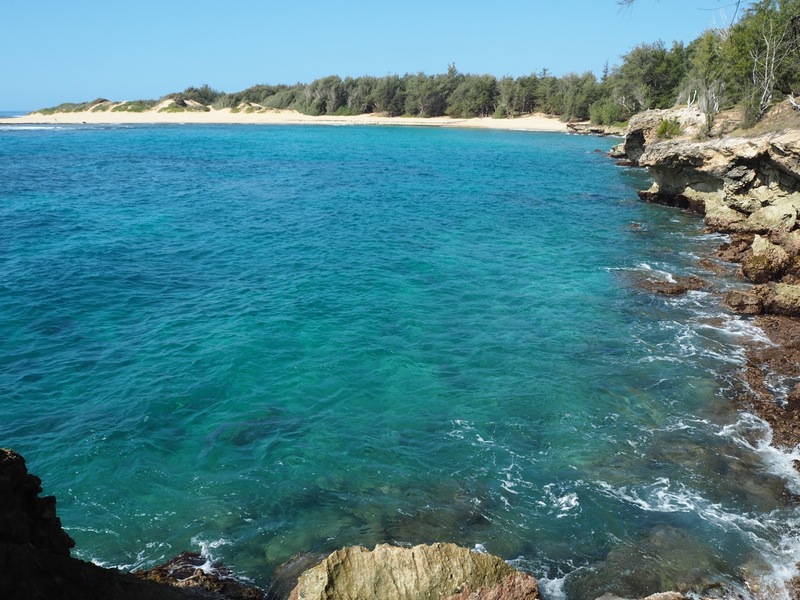 Don’t forget to bring your bathers so you can jump in for a refreshing swim at the beautiful Kawailoa Bay. The stunning blue water of Kawailoa Bay. The first part of this hike is relatively easy since it’s pretty much all down hill. The trail descends sixteen hundred feet over three miles through a rainforest to the rim of the Nualolo and Awa’awapuhi valleys. There is not much to see until you get to the end. 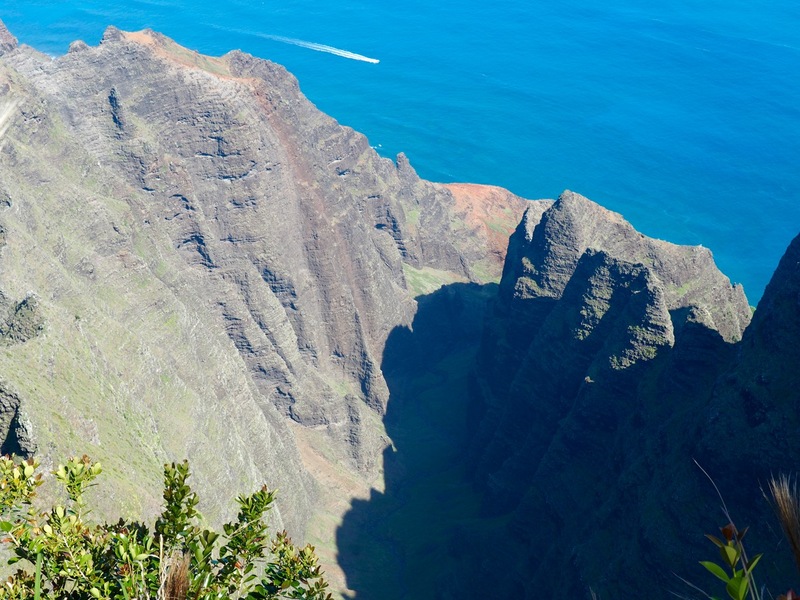 But when you reach the end the spectacular views of both valleys, the ocean and the folding peaks of the Na Pali will reward you for all of your patience! 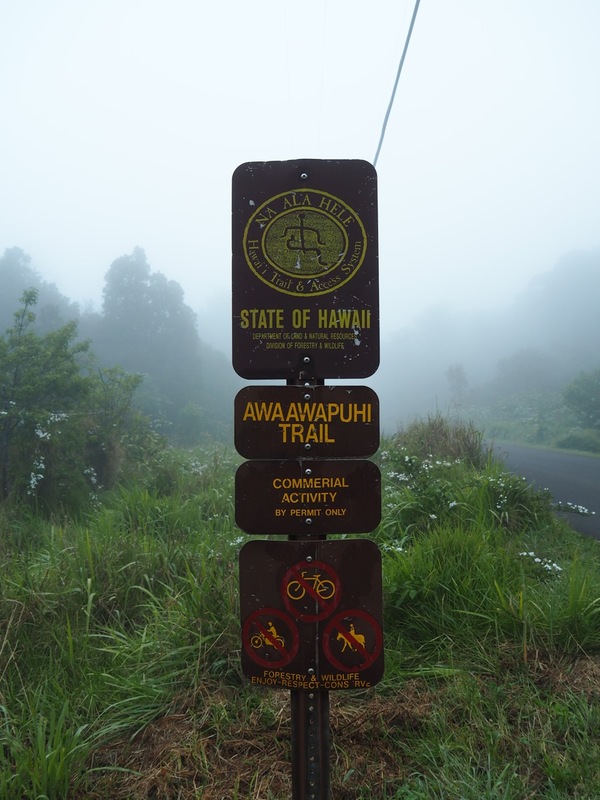 The Awa’awapuhi trail head in the early morning mist. Down the rainforest for 3 miles! Of course, the return leg is a lot less fun being mostly uphill! Just make sure you bring lots of water as you will need a few drink stops on the way back! The weather seems to be better in the morning so try and do this hike first thing. Don’t worry if it’s foggy at the start of the hike; by the time you make it to the lookout the weather could be quite different. We could barely see a thing when we left the carpark but had a bright blue sky once we made it to the lookout! Once again this hike is extremely muddy and slippery so bring some very sturdy shoes. I was amazed neither of us slipped and fell on our backsides, although we had a few close calls! 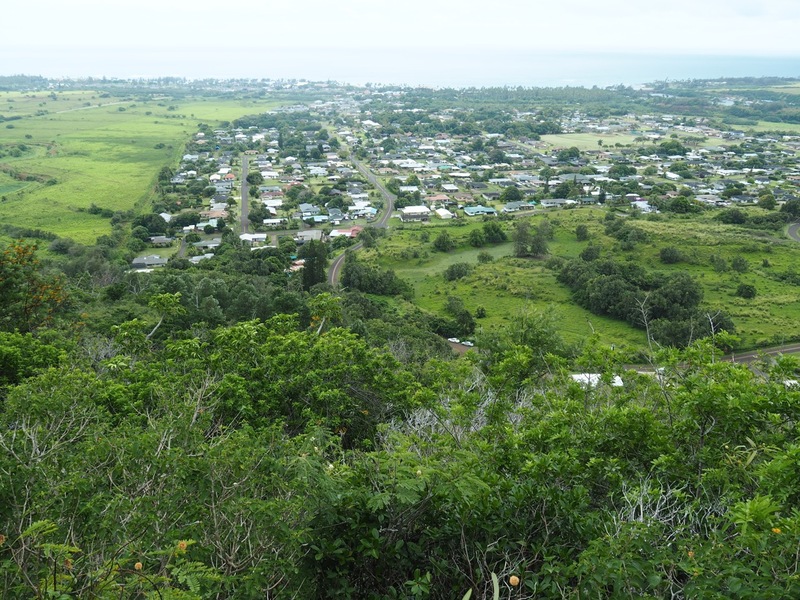 Another view from the end of the trail, the Awa’awapuhi valley. 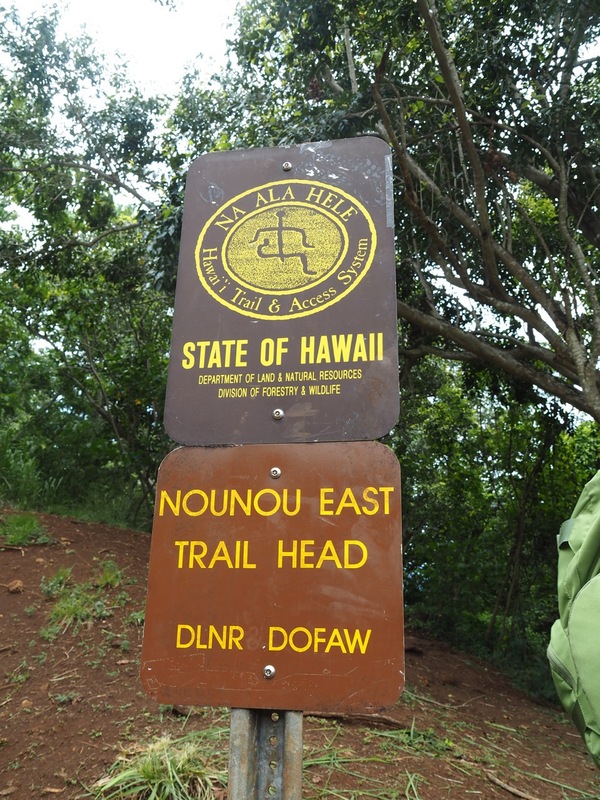 The Nounou East trail is the most popular hike on the east shore of Kauai. It is moderately strenuous and climbs up a thousand feet above sea level. 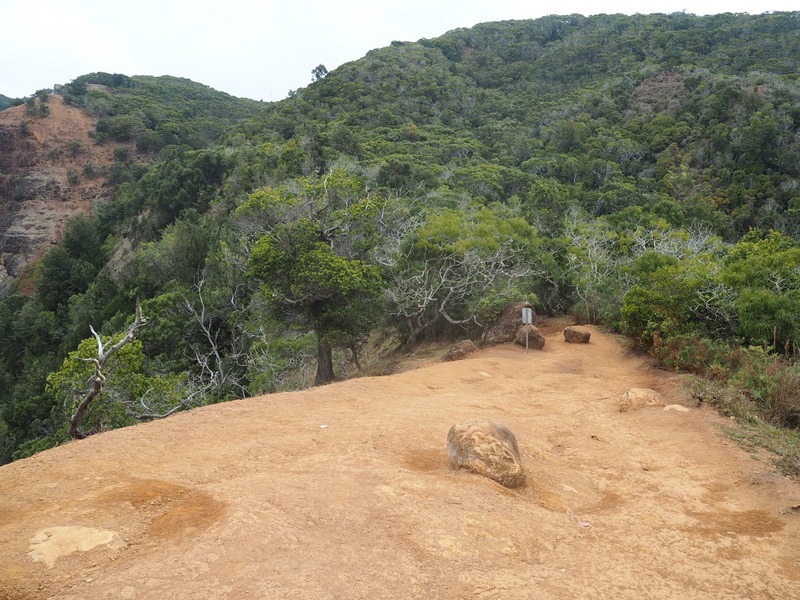 This steady uphill hike has some switchbacks and goes through a forested area at first until you emerge to some gorgeous views of the coastal areas of Kapa’a, Makahela Mountain, and Mt. Wai’ale’ale. The Nounou East trail head. You’ll come across a grassy spot with a sheltered picnic area and some astonishing views of the valley below, stretching all the way out to the ocean. If you aren’t afraid of heights and are sure footed, continue on to the giant’s head and nose. It gets a bit scarier from here but you will get 360 degrees view of the whole area. 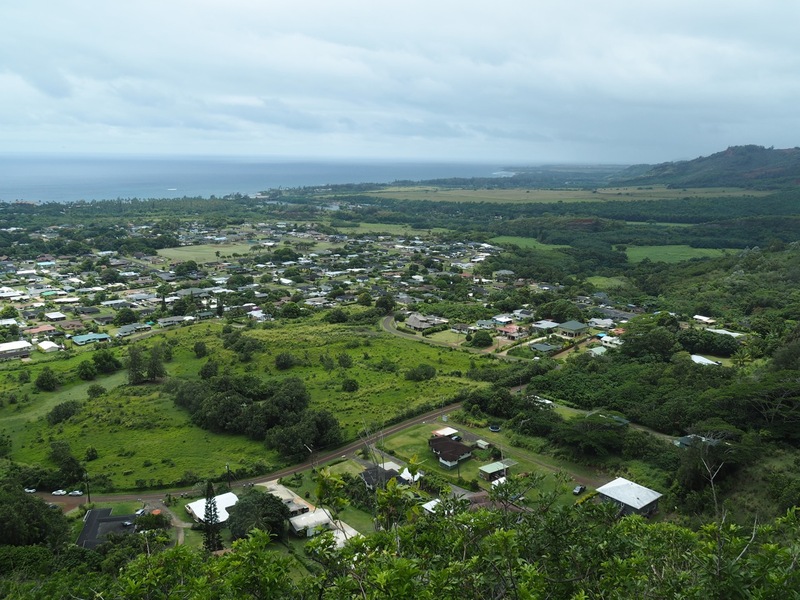 The view over the Kapa’a area. Bring a picnic lunch to have once you get up there! 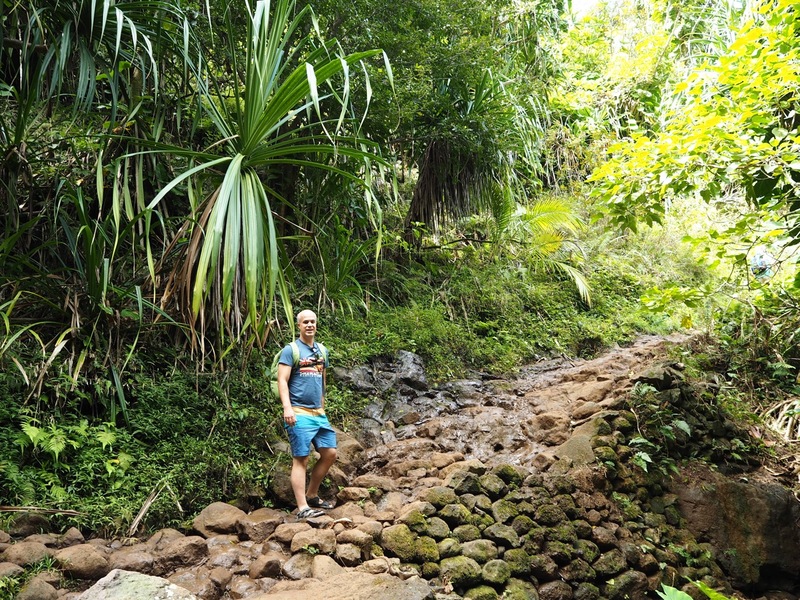 There are many more hikes to choose from on Kauai and unless you live on the island or holiday there every year you may never be able to try them all. 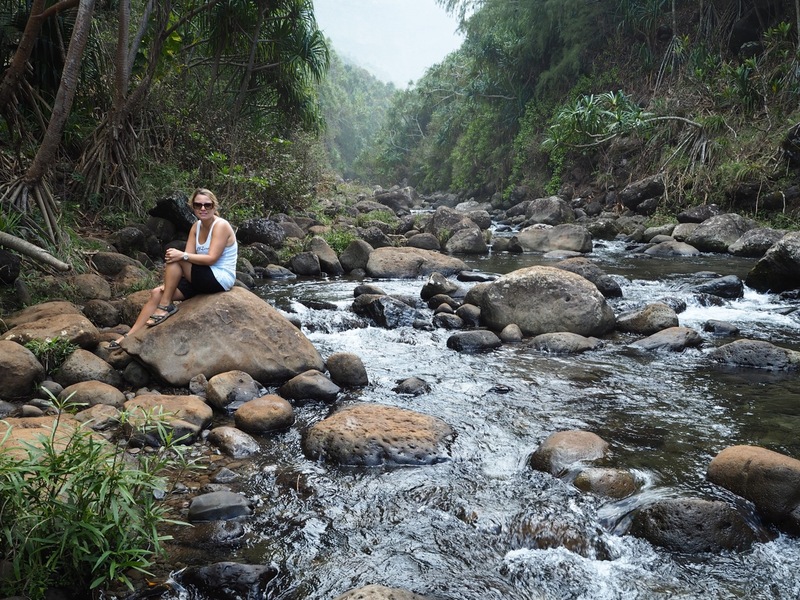 What is your favourite hike on Kauai? All these are within how much distance from each other. I am wondering how long it can take to do all of them with some rest days included in the itinerary. They are pretty much all in different sides of the islands apart from the Canyon Trail and the Awa’awapuhi Trail, they are a 10 minutes drive apart. The others would be one or two hours drive from each other. You’d need to do one a day unless you are a very serious hiker. 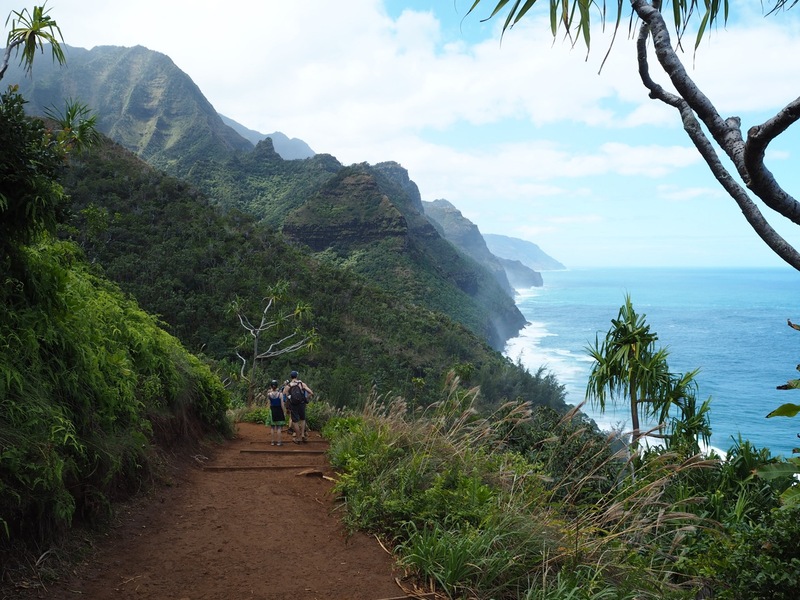 You could probably do the Canyon trail and Awa’awapuhi Trail but that’s a lot of miles… It really depends on your fitness level. I’d say if you had a week you could do them all with a couple of rest days. 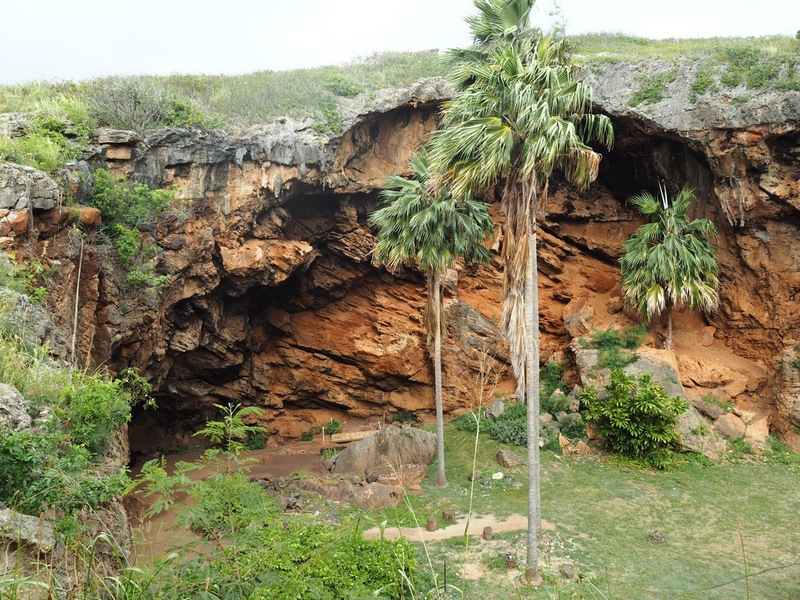 Keep Maha’ulepu Heritage Trail for last as this one is easier on the legs. I hope to get to take at least one of these hikes one day soon. Gorgeous views and things to see. This is one scenic hike. I would love doing this one. The board with the warning sign is scary though. 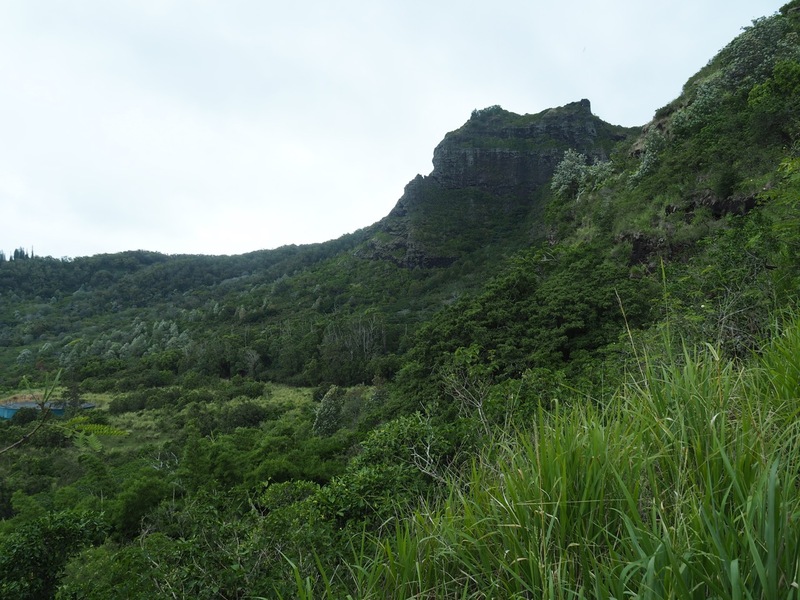 All these hikes are on the same island of Kauai. If you rent a car it is pretty easy to access everyone of those hikes. Just start early has parking is always scarce everywhere on Kauai.